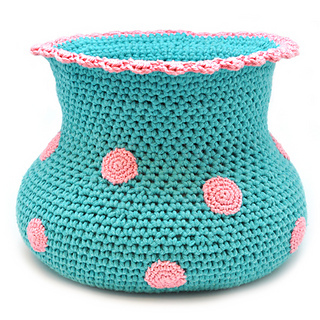 Crochet Pattern Polkadot Vase - This cheerful vase with pink polkadots is the perfect item to fill with gorgeous (crocheted) flowers. Put a jar in it and fill it with a real bouquet of flowers or use it as a decoration for your crocheted self made flowers! Our amigurumi expert Annemarie will crochet a flower a week to decorate the vase. Are you joining her?